Card Text Play: For the remainder of the turn, each friendly creature can be used as if they were in the active house, but can only fight. Flavor text And one only comes to slay. Does the “Play:” ability for Horseman of War make it so I can only fight (i.e. not reap or use other abilities) with my creatures? Yes. 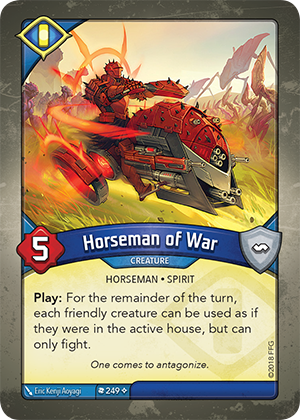 When Horseman of War is played, all friendly creatures (including those of the active house) may only be used to fight. This effect lasts for the remainder of the turn.